In Suite you can catch-up on your favorite sports team on the HD-LCD TV via DirecTV. It's your vacay and you should just have it "your way". Like all guests at Aloha Aky you can enjoy the included continental breakfast in your room anytime of day or night and you have access to lots of land and water-sports amenities to make your stay on the property beyond relaxing. AlohaAKU Inn & Suites is a tucked away, one-of-a-kind vacation gem. Our luxury Beachfront estate has 4 beachfront one-bedroom suites and a garden view two-bedroom 'ohana (family suite). Each suite has a private entrance and is like having your own condo at the beach on Maui. This one-of-a-kind property place is hidden behind a private, double gated entrance, lined with 700 ft. of lighted coconut palms that lure you into the feeling of leaving the world behind. 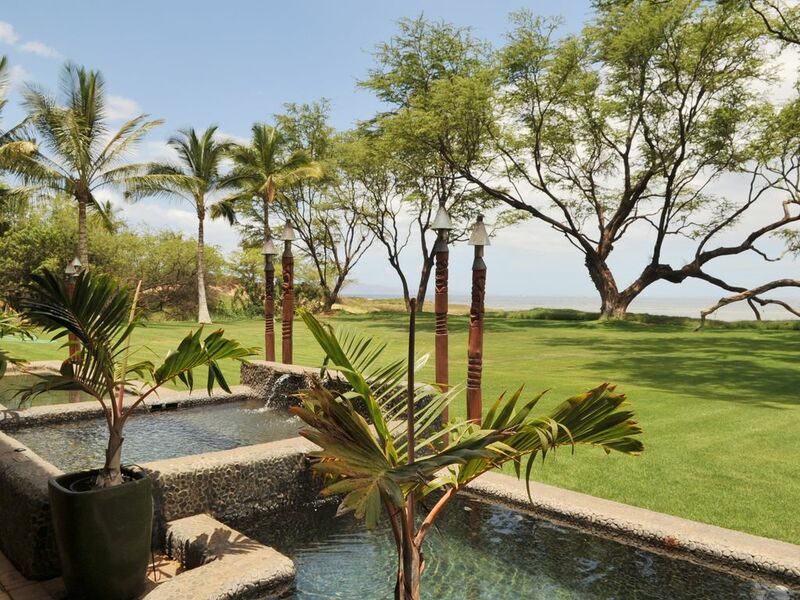 Yet it is still centrally placed in Kihei nearly all of the amenities you might desire! My husband and I stayed at Aloha Aku for a week. It was amazing to watch the sun rise and set on the ocean while enjoying complimentary coffee and banana bread. We took the ocean kayak out and saw many turtles and whales breaching on the horizon. The accommodations were very private, clean and comfortable. I would definitely stay here again. We also enjoyed the birds and water fowl. Great place! Aloha AKU was our home away from home for 7 days and it was absolutely wonderful! We had the privacy we wanted, quiet beachfront patio and access to all the amenities we needed. Hands down one of the best places we've stayed. The property was gorgeous and very clean! We would love to go back!! Home away from home...that's our goal. We're so thrilled you had a wonderful time. Looking forward to having you again, Mahalo for the lovely review. Easy to get to and has everything you need! Easy access to beach! Plan on coming back soon!! Mahalo Doug! We are happy that you enjoyed yourself. Looking forward to having you back! Aloha! Great place; highly recommend. Already dreaming about returning. Great property. Well maintained and thoughtfully equipped with everything you might need. Would give it 5 stars but the spa was not working the first few days. Also, the bathroom is located in the bedroom and the walls do not go to the ceiling, so when you use it during the night, it's hard not to disturb your partner. Other than that, it is perfect. Ideally located, close to everything, great view, very clean. Mahalo Andrew, we appreciate the feedback! Glad you had a wonderful stay otherwise. Aloha! This was our first visit to the islands of Hawaii and we were looking for the perfect beach front experience. The moment we drove through the gates of the property we knew we had found our paradise. The grounds are beautifully maintained and just a few steps to the beach. The Bamboo Suite is simply a home away from home, every attention to detail was complete. The beach was incredible with gorgeous sunsets, a mix between gentle waves and moderate surf, and miles of beach to walk on. The spa and dipping pool was a great way to end a day. We enjoyed nature here as well, watching the sea turtles at the beach and a small conservation area adjacent to the property was home to a multitude of bird species. There are only five suites on the premises so it is quiet and tranquil but only a short ride to restaurants and nightlife. We are already planning a return to our paradise, Aloha AKU. It makes us incredibly happy to hear you both had such an incredible time, and loved it here. That is our main goal, to offer the perfect beach experience. We look forward to having you here again! Mahalo and Aloha! We are very happy to hear you had a wonderful time!